Peter Oswald and Lisa Stratford are the proud parents of Sadie, an energetic toddler. Here Peter, Lisa and Sadie talk about the discoveries Sadie makes because of the many books in her life. "I don't know if I'm up for this one, Sadie," says Peter, when she brings him another book. This one is Dr. Seuss's Horton Hatches the Egg. "Sometimes we'll go through 10 or 15 books in one sitting," says Peter. "She just can't get enough." 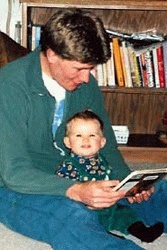 Sadie reads with her father. Twenty-one-month-old Sadie is sitting expectantly in his lap. "Papa," she says. Then, "Ree-it, ree-it." Peter starts in and Sadie follows along, enraptured. They've already read Where the Wild Things Are, Berry Bears and There Once Was a Puffin. As soon as they finished eating dinner (caribou enchiladas), Peter asked Sadie if she wanted to read. "Yap," she said. "Do you want to pick out a book?" "Yap," she said with complete surety. Books. There are books all about the house, as though they are part of the furniture. They adorn the floor; they are piled on tables; they are stacked on shelves. Most of them are library books -- the family regularly visits Loussac Library, where Sadie is part of a reading group called Lapsit. "Sadie goes through books so fast, we could never buy enough for her," says Lisa. "The library is a such a wonderful resource." On the refrigerator hangs a poster-sized alphabet, drawn in black marker by Lisa's hand. But of course the most popular letter of the alphabet is "S." "I've started to put ‘s' on lots of Sadie's things," says Lisa. "The bottom of her cup, on her bowl." 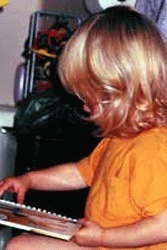 Sadie runs around in a T-shirt and no pants, her blond curls bobbing on her shoulders. She grins and pulls her shirt up to her neck. Above her belly-button is a sparkling blue sticker: the letter "s." "What does ‘s' stand for?" "Say. Say." Of course she can't quite do the reading herself yet -- she's still mastering the alphabet -- but she looks at the pictures on her own and spits out words like "dot" (dog) while Lisa and Peter help her out, pantomiming the story. And she's been known to have the book upside down -- but she's got the right idea. She turns the pages and looks at the pictures; she is learning narration, words, concepts. She's learning how to think. A few days ago, Sadie learned to use the toilet. "Sadie had a big day today," said Peter. "Lisa called me at work and told me. She put Sadie on the phone and Sadie said, ‘pooh-pooh.'" "Pooh-pooh in the potty" has become a regular phrase around the house. "We want her to think it's a really really good thing to go in the toilet," says Lisa. And Peter adds, "Sometimes she'll sit there for ten minutes. She reads books to herself and is perfectly content." In the bathroom, along with a child's bathing-suit, drying t-shirt, and bathtub toys, Sadie's potty sits beside a bin of books. Give her a book and she could be lost in there for hours. The things Sadie learns about in books help her discover her immediate world. She runs into the kitchen and points at the white linoleum. "Poh beah had," says Sadie. "Show us the polar bear head," says Peter. "Had," she says and pats her head. "Had." Then she bends over the floor and points again. And there, if you really look closely, is a white spot no larger than a pencil eraser. And it does resemble a polar bear head, if you use your imagination. "Sadie came and got me the other day and dragged me out to see her polar bear head," laughs Peter. "We're reading this book about polar bears and everything she sees looks like a bear." The surprises come every day. A few weeks later, Peter has this to report: "Today Sadie read Horton Hatches the Egg to Lisa! She turned each page and, in ‘Sadie speak,' told Lisa at least one word on each page that had made an impression on her. Amazingly, her abbreviated version of the story made just as much sense as the one with all the words. You never quite realize how much she is learning until something like this happens."